A Yorkshire-based homelessness charity is hosting its annual sleepout fundraising event, said to be the biggest one to date. Taking place at the Royal Armouries in Leeds, on 27- 28 September, Simon on the Streets has partnered up with national charity CEO Sleepout to expose participants to the harsh reality of rough sleeping. 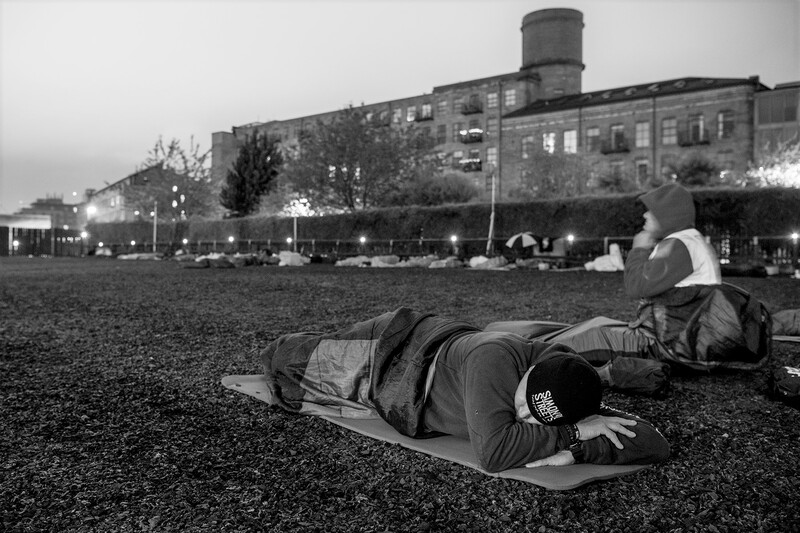 Sleepouts are pivotal to the charity’s fundraising, as it relies solely ondonations and partnerships to continue its vital work in the community. Last year’s Leeds sleep-out raised an outstanding £15,800. More recently, the charity hosted its second sleep-out in Wakefield, raising £5,159 with local business RED Media. Founded in 1999, Simon on the Streets is an independent charity, working with local people who are affected by homelessness and rough sleeping in Leeds, Bradford and Huddersfield. The organisation offers street-support to individuals who have complex needs and cannot access mainstream services, due to behavioural issues or mental illness. “This years sleepout is going to be bigger than ever, we’re delighted to have partnered with CEO sleepout and have been following their fantastic work for years. It’s great to see a national organisation supporting local charities, helping to improve the lives of people in communities across the UK. This year’s ‘Sleep with Simon’ event is in partnership with CEO Sleepout, a charity which hosts numerous sleepout fundraisers across the UK. The charity challenges high profile CEOs, business leaders and execs to take part in the sleepout with a target of raising £1,000 each. Operating on a national scale, it is a community driven organisation supporting local charities, such as Simon on the Streets, in its host cities. Although sleepers will be spending a night on the streets, the event in no way aims to replicate the difficult conditions experienced by rough sleepers on a daily basis and will be heavily stewarded. The charity’s dedicated outreach supporters will be there to share their knowledge and raise awareness of their invaluable work. All attendees will also receive a limited edition ‘I slept with Simon’ t-shirt. An evening meal, sponsored by the Torsion Group, one of the charity’s corporate ‘5 for 5’ partners, will be provided by dedicated Simon on the Streets supporter and BBC Good Food 2018 winner Manjit’s Kitchen. Entertainment on the night will include a performance of ‘Mother Courage and her Children’ by Red Ladder Theatre Company, as well as The Hepworth Brass band performing upon arrival. Simon On the Streets is a registered charity (1165317) that focuses on unsupported people with a history of rough sleeping in Leeds, Bradford and Huddersfield. The team offers street-based, emotional and practical support for those who cannot access mainstream services. Part of Simon on the Streets’ role is tackling the behavioral issues and mental illnesses that result in homelessness and addiction. For more information about the charity, visit www.simononthestreets.co.uk or tweet @simonotstreets. © Copyright 2019. Simon on the Streets.